Cool! Instead of leaving notes, you can write directly on the surface of the 1.7 cu.ft. fridge. Markers and eraser included. 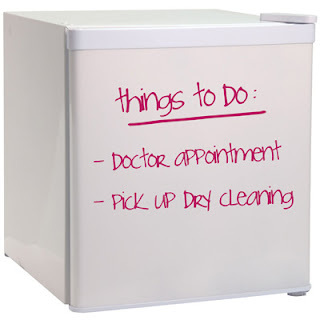 ....but most enamel fridges are suitable for writing on with whiteboard markers! I've been doing it for years! Really???? I guess not many people know that. Thanx for the info! Will try it...if I dare to!